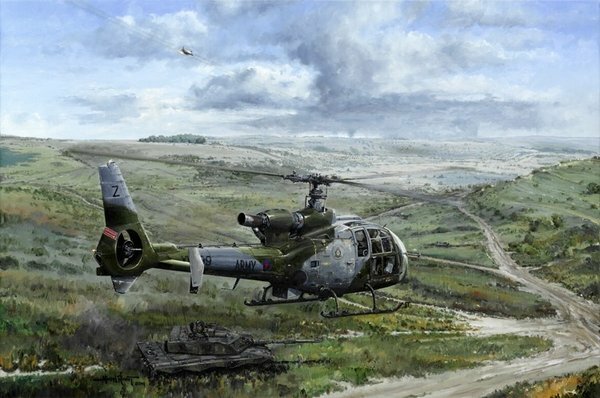 Michael Rondot's spectacularly detailed painting shows a British Army Gazelle helicopter in action during a live firepower demonstration on Warminster Ranges, Salisbury Plain. Acting as airborne forward air controller, the Gazelle pilot is guiding rocket-firing RAF Harriers in close air support while hovering above a Challenger II tank moving into its firing position. In the background, the rolling Wiltshire hills and distinctive-shaped woods of Salisbury Plain provide a panoramic backdrop that will be familiar to all who wear the Army Flying Badge. The edition is limited to 250 signed and numbered prints with 50 artist's proofs and remarques and 10 canvas prints. Three British Army Generals who wear the Army Flying Badge are signatories to the edition: Major General THE DUKE OF WESTMINSTER KG OBE TD DL. General Sir RICHARD DANNATTGCB CBE MC. General Sir MICHAEL WALKER GCB CMG CBE ADC Gen.